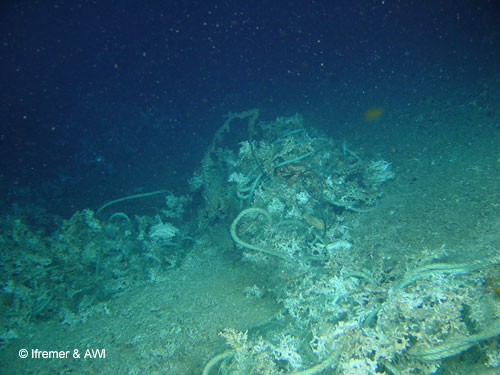 Discarded rope and fishing gear lies among crushed cold-water corals, Porcupine Seabight © Ifremer & AWI (2003). As the search for new fish stocks and oil reserves moves into deeper and deeper waters human activities are spreading into the deep ocean. In many parts of the world the seabed shows the scars of trawling for deep-water fish - species that are often long-lived, delicate and slow to reproduce. The complex structures formed by cold-water coral reefs are especially vulnerable to damage. Conserving deep ocean habitats on the high seas is a complex issue, as no single nation has control in international waters. But around the world international conservation groups and individual nations are taking deep-water conservation to heart.